OPEN TO ALL ROTARACT MEMBERS IN DISTRICT 5050! Registration begins Monday, May 18 at 10:00AM PST. All Rotaract Club presidents in District 5050 should have received an email with the password to access the registration site. Please contact your club’s president or email us at info@tricitiesrotaract.org for the password. 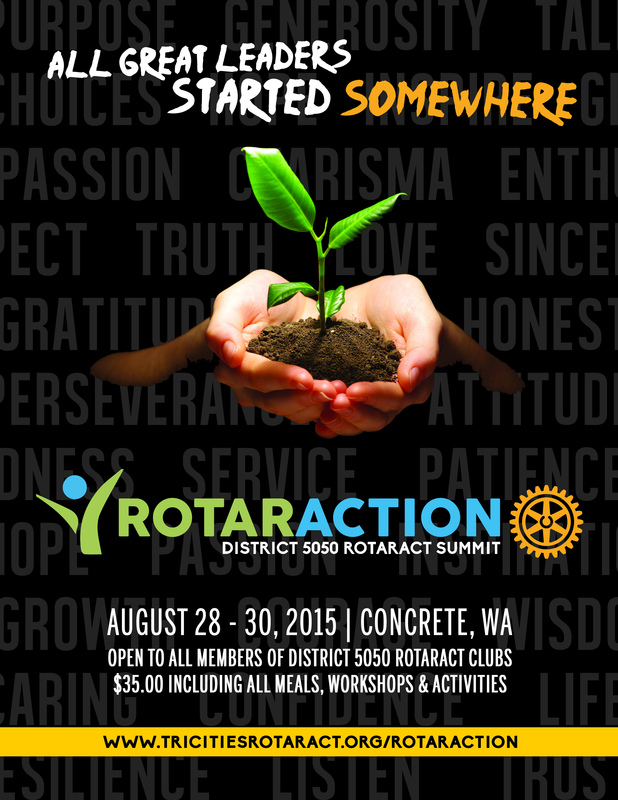 The Tri-Cities Rotaract Club is proud to be establishing the first ever RotarACTION District Summit at Baker Lake Lodge in Washington, August 28-30, 2015. The goal of the summit is to inspire Rotaract members to discover their strengths, establish connections and pursue their dreams by taking action. We also want Rotaract members from different clubs in our district to meet and collaborate with each other. There will be 5 speakers over the 3 days speaking on various topics relating to our summit themes which are inspire, discovering strengths, making connections, pursuing dreams, and taking action. There will also be workshops and team building activities, as well as a special district project that will be explained at the summit. The registration fee is $37.40 and will include all meals, your stay at the lodge, workshops and activities. Space is limited to just 32 District 5050 Rotaract members, so register soon if you wish to attend! Additional details about the summit, speakers and our program will be made available soon! Until then, if you have any questions about the summit, please contact us by email at info@tricitiesrotaract.org. Cancellation Policy: Prior to July 31 at 11:59PM, a 50% refund will be issued for cancellations requested in writing to info@tricitiesrotaract.org within 30 days of the purchase date. After August 1, no refunds will be available. Note about the venue: The address of Mount Baker Lodge (47256 Baker Lake Dam Road, Concrete, WA) does not work in Maps software such as Google Maps. Attendees will be sent directions via email upon registering, and again closer to the date of the conference.